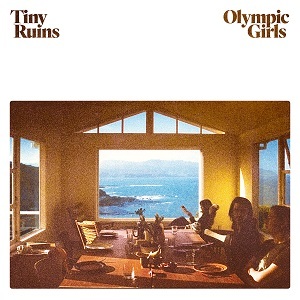 Last week, we introduced you to ‘Holograms’, the newest single off the third album by New Zealand outfit Tiny Ruins. This week, we couldn’t help but do it all over again, only this time we are running the entire album as our feature record; it’s that pretty and poignant. Led by the potent words and vocals of Hollie Fullbrook, Olympic Girls, was produced by bandmate Tom Healy. Patiently built in the same underground lair (Paquin Studios at The Lab in hometown Auckland) as their previous record Brightly Painted One. Whereas that was recorded in three short weeks, the new album was made over a drawn-out period of spontaneity and experimentation spanning a year, stridently reaching beyond Fullbrook’s formerly minimalist domain.